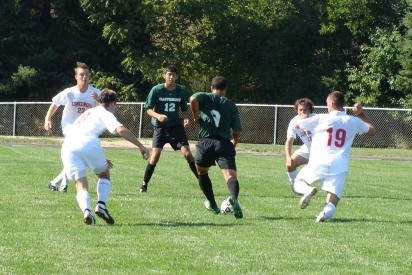 BERRIEN SPRINGS, MI–The men’s soccer team suffered another setback on Friday afternoon. The Mustangs fought hard all 90 minutes, bet fell short to the host Andrews University squad, 4-2. The Jordan duo (Berry and Largent) teamed up to score both goals for the Mustangs in the (4-2) defeat. Jordan Berry notched his 4th goal of the season, while Jordan Largent’s was his first as a Mustang. Berry has accounted for four of the Mustangs seven goals this season and is the only Mustang with more than one goal. The Mustangs look to turn the page as they travel to Defiance College to take on the (3-6) Yellow Jackets. The game is scheduled at 4pm Wednesday in Defiance, Ohio.